Well! My original Top-Down No Math Hat made a bit of a splash over on Ravelry, and I’m quite tickled about my 83 loves (and counting!) and many many queues. It is Christmas knitting season, and as I set out to knit many many variations of the hat for those that I love, I had a sudden, sickening realization. It’s kinda girly, isn’t it? See, I have nephews. Three of them. I have two sons, too, but they’re little and they’re getting hats with trains on them. I also have two nieces, and, well, pretty stuff is easy. But I have three nephews and the youngest one is ten. They don’t want cute or funky – they want manly knits. And so desperate times call for… new patterns. Pattern Note: what makes this pattern work is a particularly swish increase that I first found over at the awesomely wonderful TechKnitting: A very nearly invisible increase. Go take a look. When I use inc1 below, this is what I mean. Note that the inc1 should not “eat up” a st on your left hand needle. You should have the same number of st on your left hand needle before and after working the inc1, just as you would if you had worked a YO instead. You see what I’m doing here, right? Increasing 6 st in every other row, lining up the yos increases to make pretty swirly lines manly, nearly invisible shaping. Notice that it totally looks like you’re doing K2togs from the other direction. Freaky! If you want a less pointy hat, CO 8 st. The idea is the same as the above, only you’ll be increasing by 8 st every other row. Are you not getting the right stitch count at the end of your rows? You might possibly be using the wrong increase. The one I link to above does not “eat up” a stitch, so if you start with 6 st, you’ll [incr1, k1] 6 times. If you start with 8 st, you’ll [incr1, k1] 8 times. Keep knitting until you only have a few yards left, or until it looks like a hat. Then think about ribbing for a while. 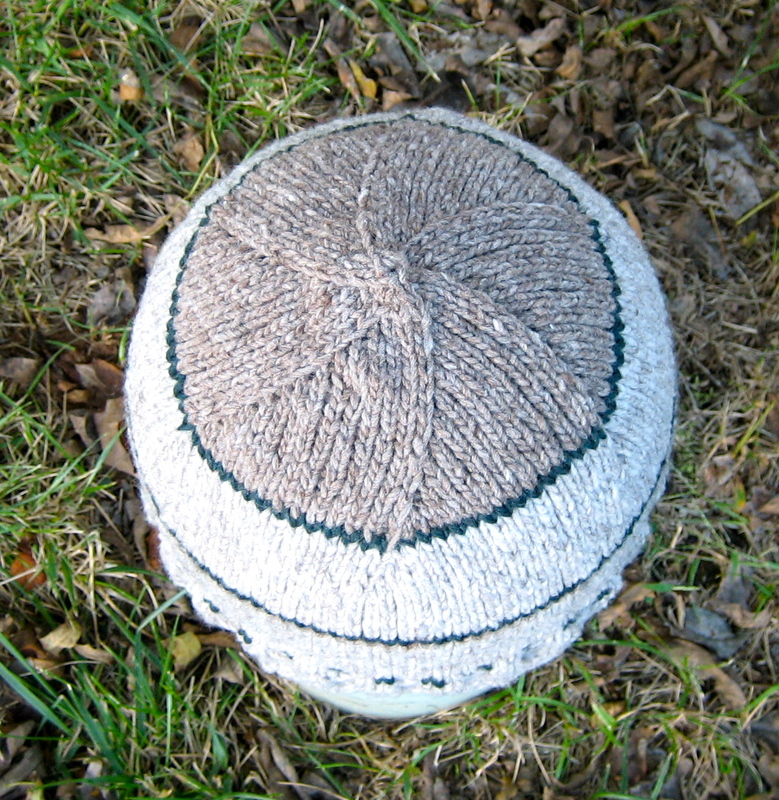 Or, if you prefer a rolled brim, just keep knitting. BO loosely. Sew in the ends. It doesn’t look like much, does it? Nothing earth-shattering. But I will remind you: it is a hat with no math! Thanks, Juliana! Please let me know how it works out for you. This looks like a great pattern. My knitting group is always looking for hat patterns that can be done anywhere, actually fit, and use up leftover yarn. This is perfect! And I’m with you on the need for a “manly” hat pattern. The woman in our group who heads up the homeless shelter hat contingent is always begging us to knit hats that a man will actually feel good about wearing. I will pass this on. 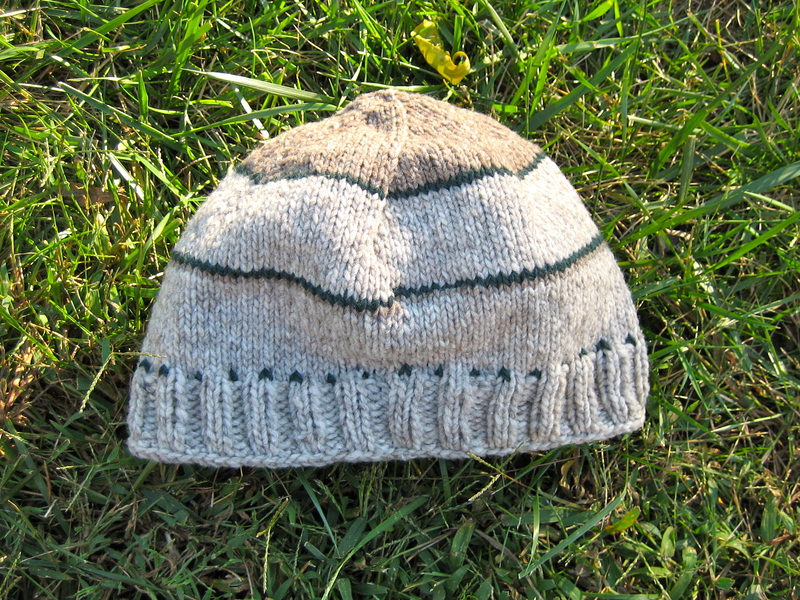 Thank you Suzyn, I was looking for a simple and quick hat pattern for gifts for my grown sons. One in NY and one in MD. This looks perfect. It should work out well since I too am a bit cavalier about amounts and sizes. Looking forward to starting these . Exactly what I was looking for. It knit up quick and easy, and received many compliments when my dad wore it. He wanted an indoor hat as he has very poor circulation and is always cold. It was easy to guestimate his size, while making it fit above his ears so that it wouldn’t block his hearing aids. ‘Only problem is, now i have orders for more. Thank you very much for the pattern. Thanks, Anne – I love hearing how things go with my patterns. Happy New Year! Reading your pattern directions made me laugh. That’s exactly how I knit. A little of this and a little of that. Yarn weight, needle sizes and gauge swatches does not compute in my brain. Just start a hat if it looks good then keep going LOL. I plan on altering your pattern for a newborn size. I keep a purple newborn hat project with me at all times to donate to the Shaken Baby Syndrome Association and am always looking for a new pattern. Thanks so much for sharing!!!! Thanks for the note, Karen! The concept works for any headsize – preemie through super-nerd! 😉 Check out my other top-down hats, too. Thanks, it’s like magic! Am converting a too-big headband i knitted in entrelace to a hat, so am going to join this skull bit. Huh, Well, the cone part can be fixed by starting with 8 st and doing 8 increases at a time – that seems to work for some people. As for the swirl, I’m not really sure! I’ve been working and re working this hat on magic loop. 6 stitches co ( 3 on each needle) , increase, knit, increase knit, increase, knit every other row only gives 3 extra stitches per even row. How in the world do you get 6 extra stitches right off the bat? I’m boggled! What am I missing? It’s a great hat and I’m determined, but mystified! Haha! Ok..I got it! I was using a different kind of increase and that was messing with the sequence. Once I used the increase you posted, it all came out perfect! Looks a heckuva lot better too!!! Thanks!! Ah, I was just coming to try to help you, but it looks like you’ve helped yourself! Isn’t that the best way? Yes it is!! I was doing a KFB increase which puts the 2 stitches on the left needle, then knitting the next one, which had me increasing every 3rd stitch! I didn’t realize there were so many differences with a given increase stitch! This is such an elegant looking increase stitch! Easy to follow and visually eyeball where the next increase is without counting! I knit while on the phone, standing up, waiting for dinner to come out of the oven, pretty much just squeeze it in anywhere, so who has time for math!! 😉 this is beautiful on magic loop, which I use for everything!! Again, laziness and clumsiness does not go hand in hand with more than 2 needles!! Haha! LOVE top down anything too! Nothing beats the “try as you go” method in my book!! Thanks again for the brilliant pattern! So I’m casting on 8, 4 on each needle, knitting the first row – all is well! Yes, you want to do a whole round of increases each time. If you start with 6 st, you’ll have 6 increases each time. If you start with 8, you’ll have 8 increases. Super, so round 4 I’ll be increasing for 2 sts, then k1, then increasing again? and so on for the other rounds? No – you increase the K each round, not the Increases. So round 2 is Inc1, K1, Inc1, K1, Inc 1, K1, etc etc. round 4 is Inc 1, K2, Inc1, K2, Inc1, K2… The number of Ks between increases grows, but the total number of increases remains steady. If you increase more than 6 or 8 times every other row, you’re going to get into ruffle territory. Just thought I’d let you know it’s going really rather well! I think it’s the yarn I’m using – I can’t even see those lovely little twisty lines at the top (not sure if the wanting it pretty bit of me is sad, or the ocd bit of me is happy!) But yes – going swimmingly – must measure the other halfs head tomorrow else it could go all kinds of wrong! Sooo, I was in the middle of knitting a top down beanie exactly as you have explained it when I found your blog post via a Google search. It was right on top. 😀 I love it! The thing to remember is that it’s NOT kfb. You create a new stitch by stitching into the stitch below the next stitch, then you work the next stitch like normal. Hope this is helpful. Hell, I am having the same issue as those above. I know this is a “no-math” hat, but the math does not add up. i started with CO8 then knit around, fine. but then i do INC1, K1 around, this is 4 increases in the row. Using either the technique you posted above of picking up the stitch below and knitting it, or doing a KFB it still only adds 1 stitch per increase. so then I am only adding 4 stitches total in each increase row, not 8. Somehow the increases need to add 2 stitches. 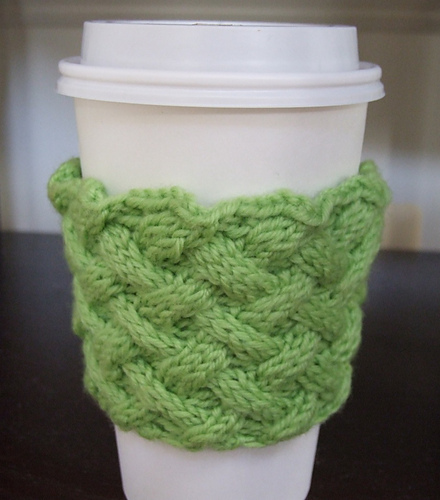 am I to pickup the stitch below and knit it, then KFB in next stitch? which would add 2 stitches in each increase? If you’re using the increase I’ve linked to, it should not “eat up” a stitch on your left-hand needle. So think of inc1, k1 this way: create a new st, then use up a st on your left hand needle. In this way, you’re creating a new stitch inbetween all the stitches you started out with. If you’re more comfortable with kfb, just kfb that entire round. Casting in 8 sts and following step by step but yr pattern instructions concerning the rows don’t add up to the stitches you state. Row 2: you state will have 16 stitches but I fact it should be 12. And every even row ect, so I’ve had to amend and hope it will work out right. I think you might be using a different increase than the one I linked to. The increase I recommend does not eat up a stitch on the left needle. So if you start with 8 st, you’ll [incr1, k1] 8 times, for a total of 16 st by the end of row 2. Hi, Suzyn–thanks for posting this free pattern on Ravelry! I had just finished my third “how the heck do I know when to start decreasing” hat and was disgusted with the whole process, so I searched Youtube for the Emily Ocker cast-on and liked your version very well. Then I started knitting (on waste yarn) and after only 3 tries got a version of an 8-stitch cast-on I could live with. Yay! Success! I started in on yarn that works well on size 8s, using the 2-circular-needles method for working in the round. (I don’t have a problem with the increases adding up properly–I had been doing a lot of fingerless mitts, with M1L and M1R increases for the gussets, so I just decided to stick with M1L because to me it looks tidier, with a smaller hole. The only difference is that I do K1, M1L, so the final increase happens *between* the two needles and it’s extremely simple to pick up the “strand below”, make the increase, and then start the second needle with a knit stitch.) So far, so good. When I tried it on the top of my head (which I had been doing all along), even after a few rounds of straight stockinette, it was obvious that it was not going to look right. My question (and I do have one!) is, What should I do differently when I frog this version and start over? Is the 8-stitch cast-on inherently wrong for me, or is it something so obvious that I’m going to smack my head in disgust? Sorry to be so long-winded, but my brain doesn’t self-edit anymore. Thanks in advance for any light you can shed on this murk. So thank you for your generosity, and happy knitting. It sounds like you’re increasing too fast. That’s what the ripples mean. If you’re using CO 8, you should only ever have 8 increases in every increase row. Is it possible you’re continuing to do [K1, M1L] all the way around? That would cause ripples. If you’re only increasing 8 times in any increase row, then the next thing I would try is 7 or 6 wedges, instead of 8. Let me know how it goes! I cast on 8 stitches, and carefully divided them onto my 2 circular needles. I carefully made the first set of increases by KFB each stitch: now 16 st., 8 on each needle. I knit the first round of plain stockinette. Then (fatal flaw!) I put the work down b/c my brain was fried and my shoulders were up around my ears from tension. When I came back, much later, I did the “first” round of increases, using M1L, adding 8 st. to each needle. Directions had said add 8 st, and I thought to myself, this is a piece of cake! Knit around, tra-la-la. 16 st on each needle, evenly divisible by 2, so since (I *thought*) I was now on the 2nd round of increases, I knit 2, increased 1. Third round, 24 st., easily divisible by 3; K3, inc 1. etc. And thereby continued adding 8 stitches TO EACH NEEDLE every other round. Oh, the power of compounding! (I wish I could do that with my money!) One simple (but fundamental) error, and I end up with a giant pink manta ray instead of a cute little clamshell.